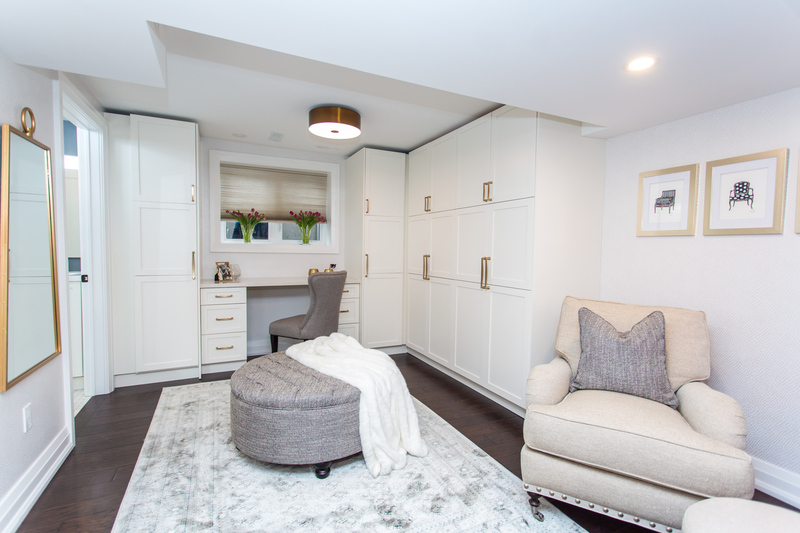 Handyman Bryan Baeumler and his wife, Sarah, continue to triumph over hardships, on HGTV Canada’s Bryan Inc.
With multiple generations sharing the space, Bryan, Sarah and their fabulous team did not want to disappoint their clients. Hence, despite a huge mistake occurring on site, which caused serious implications for Paul, the electrician, the show’s co-hosts manage to regroup to complete the splendid space. Tasked with curating a basement apartment for the family’s matriarch and patriarch, the couple managed to fashion one of the most elegant basement apartments! So, without further ado, let us share some of the greatest highlights of this makeover! 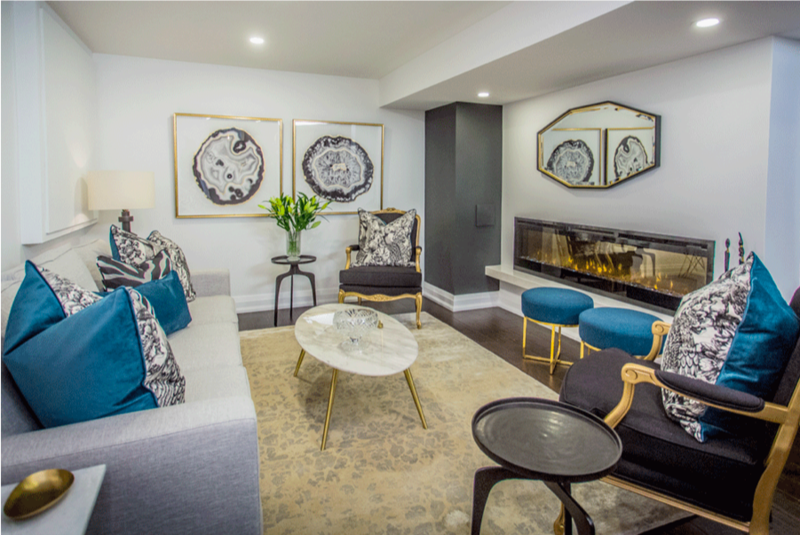 Since one of the clients, Bernadette, had a specific style and particular taste, Sarah was initially nervous about picking out the right furnishings for their clients’ new forever home — talk about pressure! However, it seems that her worries were misplaced as Bernadette’s jaw literally dropped after seeing the alluring space for the first time. Not to mention, we love how our Very Square Collection makes a seamless appearance in the space! The baseboard definitely adds a sense of grandiose to the space, as the large profile of the trim not only helps frame the space but also offers visual depth to the area! 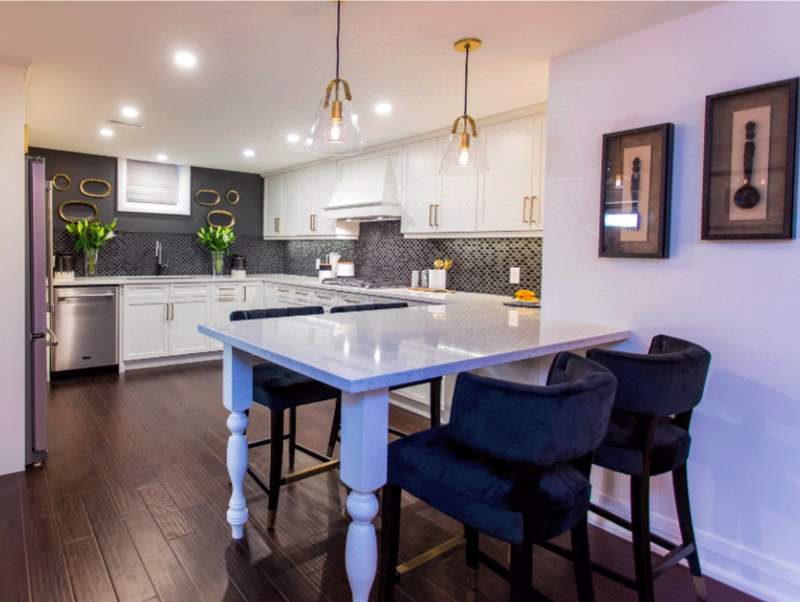 Our baseboard made another appearance in this kitchen’s open plan. With nine people living under the same roof, this very active kitchen needed to be spacious to accommodate the family’s needs. That being said, the layout of this space with a substantial island dining table were key for the client’s large family gatherings! 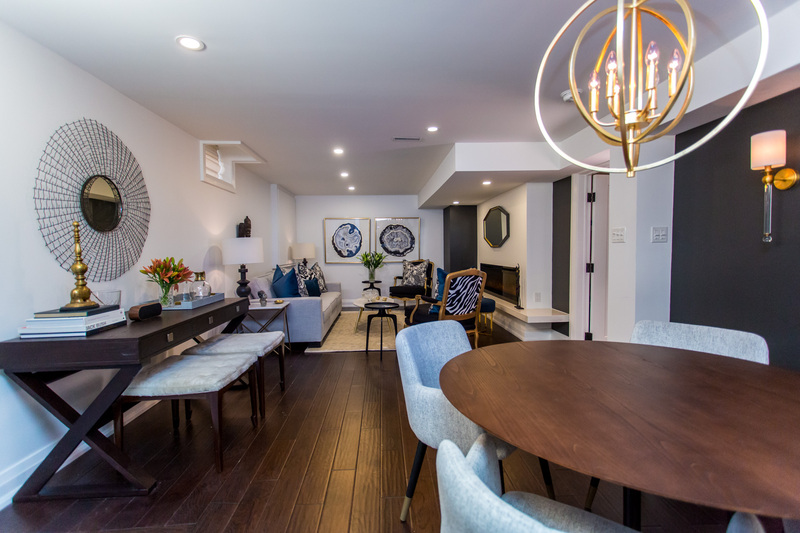 The formal dining room and entryway serve as a versatile place to entertain guests, all thanks to Sarah’s selection of practical, yet aesthetically pleasing decor! From the wall to the decor elements, the space is cladded in contrasting blacks and whites to create a stunning juxtaposition that conveys glam and luxe! Once again, our Very Square baseboards are spotted throughout the space, to add architectural interests to the open-concept. Since Bernadette was heavily involved throughout the design process for the basement, Sarah wanted to surprise her with something. That something is to have the bedroom encased in white snakeskin wallpaper! The snakeskin wallpaper adds a subtle texture to the room and incites visual intrigue. 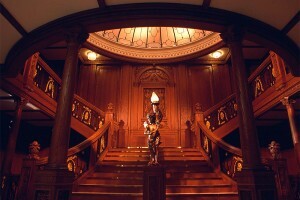 Thus, making it the perfect, understated design choice since it won’t take the focus away from the rest of the space! That being said, the bedroom also has large built-in cabinetry that offers the couple plenty of storage space! 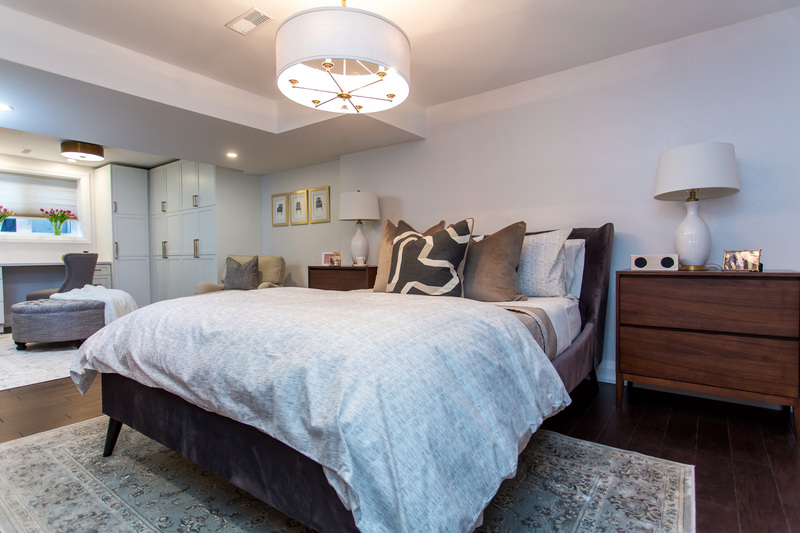 The custom cabinetry adds structure and helps divide the open bedroom to create a more intimate ambiance. Meanwhile, the casing and baseboard from our Very Square Collection possess strong, crisp lines where the precise geometry complements the lines found on the cabinetry, as well as allowing it to really frame the window! Now, that wraps up the memorable moments in this outstanding episode! To see Bernadette and Cara’s reaction to this spectacular reveal, click here. With that in mind, don’t forget to tune into HGTV Canada on Sundays, at 10pm EST, to see jaw-dropping worthy makeovers from upcoming episodes! 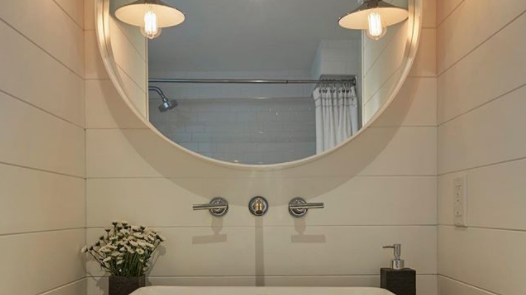 In the meantime, if you’ve enjoyed this post then take a look at our previous recaps of the Baeumler’s thrilling makeovers! Sarah Richardson’s Unvarnished Designs are Catching Eyes! 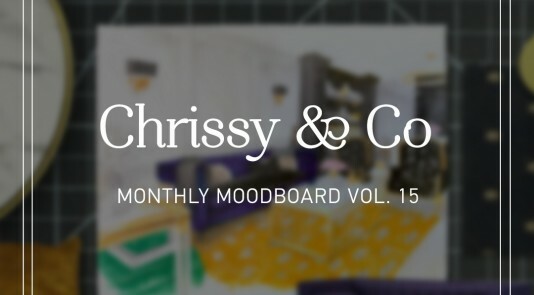 Monthly Moodboard Inspiration: Chrissy & Co.